Can additional small items be added to the medicine bags, or are most of them sealed? and secondly, these are 100% made in USA by Native Americans correct? Yes, medicine bags are designed so that you can add your personal items to them. So 99.9% of the bags we sell are for carrying items, the size of the items will depends on the size of the bag. to see which bags on that page you can empty of the sage and refill with your personal items. All other bags are ready to be filled with your sacred objects. are made in the USA by Native American artists registered with a recognized (by the US government) tribe – the individual pages for each bag will will tell which tribe the artist belongs to. The ones in the Reproduction section toward the bottom of the page are made in the USA but by people who are not registered with a recognized (by the US govt.) tribe. Some of the artists there are Native Americans but just don’t have a government number so legally we have to call them Reproductions. 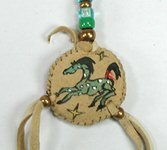 Good morning and Happy Cyber Shopping today and every day at Horsekeeping, the webstore of Native American Jewelry Tips. Stocking stuffers to Special Gifts. Some Mother of Pearl can be from Abalone but not all Abalone is Mother of Pearl. An abalone is a mollusk whose shell is irridescent on the inside. The shells are used whole as smudge bowls. Portions of the shells are used as buttons and decorations on medicine bags. The ABALONE represents solace, the greatness of the oceans, a life of beauty, gentleness, caring, comfort, peacefulness, and delight. Abalone shell discs are an age old object that has been traded tribally for centuries. It is a symbol of power and protection and symbolizes ancient travels. Mother of Pearl (MOP), also called nacre, is the inner layer of some shells. It is made by when the mollusk (the organism inhabiting the shell) makes crystals – this is an oversimplification, but think of it like an oyster making pearls – very similar. MOP is a blend of minerals that are secreted by oysters, abalone, and other mollusks and deposited inside their shells, coating and protecting their bodies from parasites and foreign objects. Mother-of-Pearl is said to stimulate intuition, sensitivity, imagination, and adaptability and help with clarity in decision making. Mother of Pearl stirs and awakens the primordial memory of your origin in the infinite ocean of divine love and stirs this memory in every cell of your physical body thereby producing an overall calming effect as it gently stirs the life energy of your cells. Like waves lapping the shore, this stirring is steady, relaxing, and rhythmical. Mother of Pearl has a beautiful glow and can range from a pearly white, clear or with some striation, to iridescent multicolored blues, greens, golds, pinks, whites, and purples. So…some Mother of Pearl can come from Abalone but it can also be from a variety of other fresh-water and salt-water mollusks including the pearl oyster. The Lakota are part of seven related Sioux tribes and speak Lakota, one of three major dialects of the Sioux language. There are seven Lakota branches, one of which is the Oglala who occupy North and South Dakota. The Lakota obtained horses in the early 1700s and used them to hunt buffalo and move their villages when weather or grazing required it. The Lakota were compelled to sign a treaty in 1877 ceding the Black Hills to the United States but there was continued unrest which ended up with the killing of Sitting Bull in 1890 followed by the Massacre of Wounded Knee the same year at Pine Ridge. The Lakota people are members of the Buffalo Nation or Tatanka Oyate so the buffalo is an important part of the Lakota creation story. Tatanka, the Lakota word for buffalo, means “bull buffalo” or a male bison but has a greater spiritual and ceremonial significance to the Lakota. Because the buffalo provided food, clothing and shelter for the Lakota, the buffalo is treated with great respect. The Medicine Wheel represents American Indian Spirituality – the journey each individual must take to find his or her path. The Medicine Wheel is based on the four cardinal directions and the four sacred colors. A circle represents life; at the center of the circle is the eternal fire. There are various pairings of the colors with other groups of four and it varies greatly among tribes. Native American Artifact – What is a Medicine Bag? 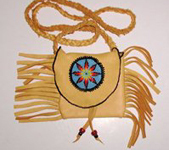 You might think that a medicine bag should only be carried by a Native American Shaman, Medicine Man or Healer. That is one type of medicine bag – quite large as it would contain many herbs and articles, sometimes as many as fifty items. Today, non Native Americans also use Medicine Bags. They are symbols connected to personal protection and power. Some wear a small medicine bag around the neck, under the clothing, or on a belt or saddle or carry it in a purse, pocket, knapsack or briefcase. Some people sleep with their medicine bags under their pillows. What the bag contains is sacred and good medicine for that person. It can be traditional items or anything else – a locket, photo, key, bullet, or coin, for example.